For the larger local government district, see London Borough of Lewisham. For other uses, see Lewisham (disambiguation). 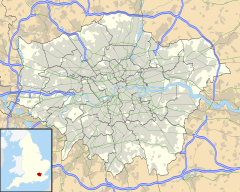 Lewisham (/ˈluːɪʃəm/) is an area of south London, England, 5.9 miles (9.5 km) south-east of Charing Cross. The area is identified in the London Plan as one of 35 major centres in Greater London. Lewisham had a population of 60,573 in 2011. "In the most ancient Saxon records this place is called Levesham, that is, the house among the meadows; leswe, læs, læse, or læsew, in the Saxon, signifies a meadow, and ham, a dwelling. A Latin legal record, dated 1440, mentions a place in Kent as Levesham which may refer to Lewisham. It is now written, as well in parochial and other records as in common usage, Lewisham." "Leofshema" was an important settlement at the confluence of the rivers Quaggy (from Farnborough) and Ravensbourne (Caesar's Well, Keston), so the village expanded north into the wetter area as drainage techniques improved. King Alfred was Lord of the Manor of Lewisham, as is celebrated by a plaque in Lewisham Library. The Manor of Lewisham, with its appendages of Greenwich and Combe, was given by Elthruda, King Alfred's niece, to the abbey of St. Peter at Ghent, of which Lewisham then became a cell, or an alien priory. This grant is said to have been confirmed by King Edgar in 964, and by Edward the Confessor in 1044, with the addition of many privileges. In the mid-17th century, the then vicar of Lewisham, Abraham Colfe, built a grammar school, a primary school and six almshouses for the inhabitants. In the 17th century the Manor of Lewisham was purchased by George Legge, later Baron Dartmouth. His son William was raised by Queen Anne to several positions of honour and trust, and was a member of her privy council; and on 5 September 1711, was ennobled as Viscount Lewisham, and Earl of Dartmouth. His grandson George, Lord Dartmouth, obtained the privilege of holding a fair twice a year, and a market twice a week, upon Blackheath in the parish. The fair used to be held on 12 May and 11 October, but in 1772 it was discontinued, (except for the sale of cattle) by the Earl of Dartmouth, as lord of the manor. The village of Lewisham had its nucleus in its southern part, around the parish church of St Mary, towards the present site of University Hospital Lewisham. The centre migrated north with the coming of the North Kent railway line to Dartford in 1849, encouraging commuter housing. The Official Illustrated Guide to South-Eastern and North and Mid-Kent Railways of June 1863, by George Measom, describes Lewisham as follows: 'Lewisham Station, situated on the slope of an eminence admist picturesque scenery, beautiful green meadows rising abruptly to the summit of the hill on the left, dotted with handsome residences and gardens, while the Common is seen intersected by various cross roads and studded with country inns and houses on the low ground or valley to the right. The area of the parish is 5,789 acres... Lord of the manor, the Earl of Dartmouth to whom it gives the title Viscount'. Lewisham was administratively part of Kent until 1889, and then formed part of the Metropolitan Borough of Lewisham in the County of London until 1965. The town centre was hit by a V-1 flying bomb in 1944: there were over 300 casualties including 51 fatalities, and it devastated the high street, which was fully restored by the mid-1950s. This horrific event is commemorated by a plaque outside the Lewisham Shopping Centre (opened in 1977). The plaque was on the pavement outside the Marks and Spencers store in the main shopping precinct. However, suffering wear and tear, the local authority arranged for it to be mounted to the façade. In 1955 Sainsbury's opened a store in Lewisham which was reported to be Europe's largest self-service supermarket, with 7,500 square feet of retail space, although the one now incorporated in the 1977 shopping centre is much smaller. The area at the north end of the High Street was pedestrianised in 1994. It is home to a daily street market and a local landmark, the clock tower, completed in 1900 to commemorate Queen Victoria's Diamond Jubilee in 1897. The police station, opened in 2004 to replace the station in Ladywell, is officially the largest in Europe. Lewisham Cricket Club was one of the most prestigious London sides during the Victorian era. From 1864 they played at Lewisham Cricket Ground, which lay north of Ladywell Road, until its closure later in the 19th century. Lewisham Swimming Club was also very successful, with several of its members representing England at water polo and other gymkhana events. During the First World War, Lewisham Hospital's infirmary became the Lewisham Military Hospital, and during the Second World War the hospital was hit by a V-1 flying bomb, which destroyed two wards, injured 70 people and killed one nurse. Lewisham is also the site of one of the worst disasters on British Railways in the 20th century. On 4 December 1957 a crowded steam-hauled passenger express headed for the Kent coast overran signals at danger in thick fog near St. John's station and crashed into a stationary electric train for the Hayes branch line. The force of the impact brought down an overhead railway bridge onto the wreckage below. An electric multiple unit about to cross the bridge towards Nunhead managed to pull up in time. Ninety passengers and crew died in the accident. In 1977, the Battle of Lewisham (actually in New Cross) saw the biggest street battle against fascists since the Battle of Cable Street in 1936. Over 10,000 people turned out to oppose a National Front march which was organised on the back of increasing electoral success at that time. The Docklands Light Railway was extended to Lewisham in 1999. In the 21st century, Lewisham has seen regeneration including the construction of several high-rise residential buildings around Loampit Vale and Molesworth Street. 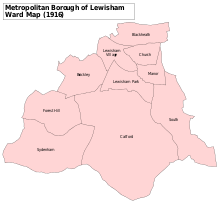 A map showing the wards of Lewisham Metropolitan Borough as they appeared in 1916. The parish of Lewisham was governed by a vestry; and from 1855 until 1900 by the Lewisham District Board of Works, in combination with Penge. Following the London Government Act 1899, the County of London was split into 28 metropolitan boroughs in 1900. Lewisham, with the parish of Lee, became part of the Metropolitan Borough of Lewisham. In 1965, under the London Government Act 1963, the current 32 London boroughs were formed and today Lewisham is part of the London Borough of Lewisham. Lewisham London Borough Council is based in Catford. The current directly elected mayor is Damien Egan. In the London Assembly, the London Borough of Lewisham is joined with the Royal Borough of Greenwich to form the Greenwich and Lewisham constituency, with the current Assembly Member being Len Duvall. For Westminster elections, Lewisham is covered by the Lewisham Deptford constituency, whose current[when?] Member of Parliament is Vicky Foxcroft. All representatives[clarification needed] are part of the Labour Party. Lewisham's commercial area is one of the largest in south-east London. Lewisham Shopping Centre, opened in 1977, has 70 stores and is over 330,000 square feet. Shops include Marks & Spencer, W H Smith, Sainsburys, H&M, TK Maxx, JD Sports, SportsDirect.com, Argos and Boots. The centre is between Molesworth Street (a dual carriageway section of the A21) and Lewisham High Street. Lewisham Market and the Library are outside the shopping centre in the High Street. Also part of the complex is the Lewisham House office tower, the tallest building in the borough and formerly occupied by Citibank. There are proposals to convert this brutalist skyscraper to flats. Lewisham has a bowling alley and the Glassmill Swimming pool and Gym. Lewisham has a number of parks, such as Hilly Fields and Lewisham Park. For 14 years between 2001 and 2015, Lewisham was the only London Borough not to have a cinema. Lewisham once had many cinemas, such as the Lewisham Odeon. In 1930 there were 30 venues showing films. As of 2015, Lewisham Borough has two cinemas: an independently owned, not for profit cinema in Deptford named Deptford Cinema and Curzon Goldsmiths, a movie space located inside the campus of Goldsmiths College in New Cross. Opened in 1894, University Hospital Lewisham is a National Health Service, acute hospital run by the Lewisham and Greenwich NHS Trust serving the whole London Borough of Lewisham as well as some surrounding areas. In July 2012 the government recommended that Lewisham's Accident & Emergency ward should be closed, with emergency provision transferred to Queen Elizabeth Hospital, Woolwich. However, there was a strong campaign in Lewisham against the proposed closure, including a march on 24 November 2012, and a successful legal challenge. In July 2013, the High Court ruled that the closure of Lewisham A&E could not go ahead. In October 2013, the Court of Appeal ruled that Health Secretary Jeremy Hunt did not have power to implement cuts at Lewisham Hospital. Sixth form and further education providers in Lewisham include Christ the King Sixth Form College, Lewisham Southwark College and Sedgehill Secondary School. Lewisham is also home to Goldsmiths, University of London and the Laban Dance College (part of Trinity College of Music). Lewisham has a major transport interchange served by Southeastern rail services, the Docklands Light Railway (DLR), London Buses and National Express Coaches. Further, there is a proposal to connect Lewisham to the London Underground network via an extension of the Bakerloo line. Lewisham railway station is served by Southeastern services to London Victoria, London Charing Cross, London Cannon Street, London Cannon Street via Bexleyheath and Woolwich Arsenal, London Cannon street via Sidcup and Woolwich Arsenal, Gillingham via Woolwich Arsenal, Dartford via Bexleyheath, Sevenoaks via Orpington and to Hayes. The Docklands Light Railway provides services from Lewisham to Canary Wharf and Bank. Lewisham is served by many Transport for London bus services connecting it with areas including Beckenham, Bexleyheath, Bow, Bromley, Brixton, Catford, Central London, Croydon, Crystal Palace, Elephant & Castle, Eltham, Greenwich, New Cross, Orpington, Peckham, Penge, Sidcup, Stratford, Welling, and Woolwich. There is planned regeneration of Lewisham town centre. Lewisham London Borough Council's local development plan entails the improvement of Lewisham's town centre to become a metropolitan centre to rival Bromley, Croydon and Kingston upon Thames. There is a skyscraper adjacent to the shopping centre which used to be owned by Citibank until they moved to the Docklands which may be converted to residential. The Renaissance development comprises flats in buildings from five to 24 storeys as well as the new Glass Mill leisure centre, which opened in 2013 and replaced the Ladywell leisure centre. Lewisham Gateway is a redevelopment site bounded by the DLR station, Lewisham High Street, the shopping centre and the railway to Blackheath. The highway layout has been changed from a roundabout to two signalised junctions, while the rivers Ravensbourne and Quaggy have been re-routed. The development includes shops, restaurants, bars, cafes, leisure facilities and up to 800 homes. The first phase of construction started in May 2014 with a 15 and 25 story residential building east of the DLR station. Thurston Road industrial estate had planning consent granted in 2008; however, the development has been heavily delayed. The development was completed in 2016  The scheme is a mixed used site, which includes residential and commercial buildings of between two and 17 storeys, as well a car park. The former Sherwood Court industrial estate is now the Chapter student housing scheme. Eman Kellam (tv presenter) born and brought up in Lewisham. Jonathan Palmer former Formula One driver and commentator. Almost all of the SE13 postcode district, which is associated with Lewisham is within the London Borough of Lewisham, except for the Coldbath Estate and part of the Orchard Estate along Lewisham Road, which are covered by the Royal Borough of Greenwich. The town includes areas such as St Johns and Hither Green, as well as Lee and Ladywell to the south and east. ^ "Plea Rolls of the Court of Common Pleas; National Archives; CP 40/717; second entry; Walter Wheler, husbandman, as defendant in a plea of debt". Documents from Medieval and Early Modern England from the National Archives in London. 2013. Retrieved 19 December 2014. ^ "Lewisham", The Environs of London: volume 4: Counties of Herts, Essex & Kent. 1796. pp. 514–536. Retrieved 19 December 2014. ^ "Legge, William, first Earl of Dartmouth". Personalia. 2014. Retrieved 19 December 2014. ^ "Lewisham, V1 Site High Street, Marks & Spencer". Lewisham War Memorials. 2014. Retrieved 19 December 2014. ^ "Lewisham council to replace plaque commemorating the lives lost in wartime bombing". News Shopper. Retrieved 5 April 2013. ^ "South East London Police Stations". Laing. 2014. Retrieved 19 December 2014. ^ "1977: The Battle of Lewisham". libcom.org. 10 September 2006. Retrieved 19 December 2014. ^ "Lewisham - Eating, Drink, Bowling, Rock & Rolling…". mfabowl.com. ^ "Lewisham's lost cinemas". 28 January 2011. ^ "Deptford Cinema - BFI Neighbourhood Cinema". www.bfi.org.uk. ^ "BBC News - Thousands march to save Lewisham A&E and maternity unit". Bbc.co.uk. 2012-11-24. Retrieved 2013-10-29. ^ "BBC News - Lewisham Hospital: Appeal Court overrules Jeremy Hunt". Bbc.co.uk. Retrieved 2013-10-29. ^ "'Renaissance' at Loampit Vale". London Borough of Lewisham. London Borough of Lewisham. Retrieved 19 March 2014. ^ "Lewisham Gatway". London Borough of Lewisham. LB Lewsiham. Retrieved 19 March 2014. ^ "Lewisham Gateway". Lewisham Council. Retrieved 13 December 2017. ^ Mark, Chandler (26 July 2011). "Long-delayed development at Lewisham's Thurston Road Industrial Estate granted extra time". News Shopper. Retrieved 19 March 2014. ^ "Thurston Rd industrial estate". London Borough of Lewisham. LB Lewisham. Retrieved 19 March 2014. ^ "Brockley conservation area, character appraisal, LB Lewisham" (PDF). Wikimedia Commons has media related to Lewisham.